I know I said the 10th, but I got pictures of the birthday today!! Let’s celebrate by showing off these great clogs! 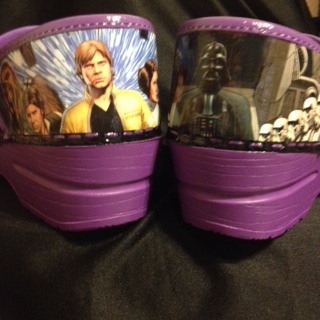 These toes will make any fangirl squee, but these were made especially for icecoldpenguin! 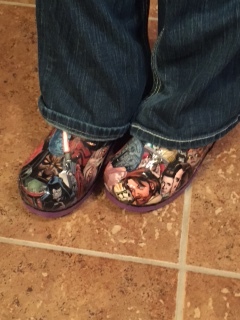 Her mom told me that she’s the biggest fangirl EVER and that she had to have these shoes for her birthday! Mom suggested a good guy shoe and a baddie shoe. 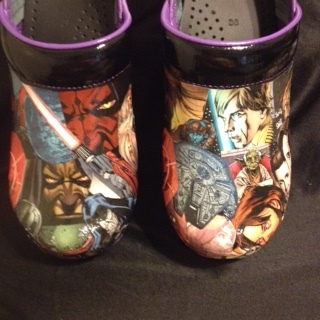 Mom got lucky as the very week she ordered these; Star Wars #1 was released! Much to the happy happy dance of fans such as myself! I was told Darth Maul is the favorite baddie! 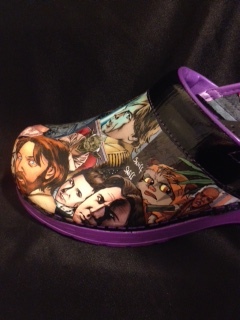 Each shoe features their enemy sited in the gun! It was so perfect! Finally, Wicket had to make an appearance with our good guys! Thank you Marvel for making these images more friendly for my particular art form! Now, get yourselves over to Fangirl Next Door to meet our birthday girl and learn all you will ever need to know about Star Wars and Star Wars Fangirls! 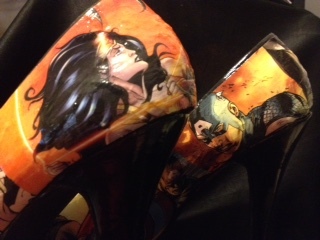 I know, I know; I haven’t revealed a shoe since the holiday…. 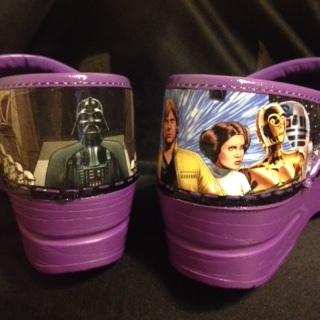 Join me in a week or two and I will reveal the newest Star Wars shoe! I know you can’t wait; neither can I! But they are a birthday present and I would NEVER spoil a surprise! For fun check out 6 Things You Don’t Know About Star Wars #1! While you wait I will be working on another Dr. Who. What? The dude is uber popular! Alright y’all; this is our first Marvel/DC mash-up! You wouldn’t believe all the fan-fiction that includes Capt. America and the lovely Wonder Woman! This pair was a gift from a gentleman to his girl. They spent the holidays in Brazil where she’s from! How very exciting! I did a lot of pairing for this set. 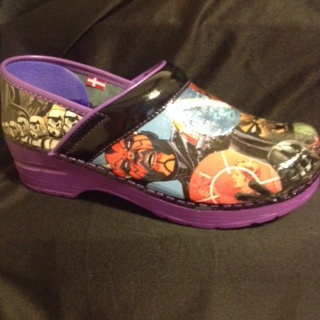 Each of our superheroes has a shield which was perfect for the toe. 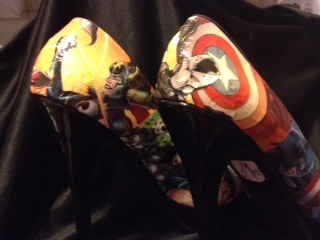 I was able to pair villains on the heels which looks amazing! Then the heroes themselves facing their nemesis! These pair were really fun! By all reports she loves them and they look amazing when she wears them!